After the success of Kiuì, presented at the start of the 2018/19 campaign, ILFRES now presents "Gustavo", Kiuì's ready-to-eat option. "Gustavo was created to meet the needs of the most demanding customers as quality is excellent and the product is practical to use," explains Ilfres' sales manager Raffaele Lasciarrea. Ilfres gathered producers and cooperatives from southern Italy and Greece through a careful selection and auditing process started around two years ago. 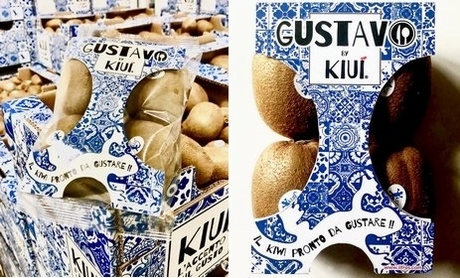 Although the 2018/19 Hayward kiwi campaign didn't have the best of starts, Kiuì managed to find its place on the market thanks to its high-quality products. It now introduces "Gustavo", which has a soft sweet flesh and is only available in 500 gram packets that include a piece of cutlery made of eco-friendly material. "We aim at supplying Gustavo 12 months a year, so also during the summer months. We will import fruits with exactly the same quality standards." It is an ambitious challenge for a group that, over the years, has managed to develop interesting alternative solutions ranging from the import of "ILFRES" salads and endive to the distribution of exotic and counterseasonal products under the "Mercante Poeta" brand, in addition to the successful banana ripening business.